Archeologists estimate that modern humans have been on Earth about 200,000 years. It is believed that homo sapiens originated in the Middle Paleolithic period in southern Africa and by about 70,000 years ago they migrated and began colonizing the entire planet. Along the way they would have encountered sea turtles. The archeological record shows sea turtles first appearing ten to fifty million years before the dinosaurs, during the Triassic period. One hundred million years ago seven turtles swam the seven seas. The same seven types of sea turtles are in the world today. One eats jelly-fish another toxic sponges and others sea grass and algaes. 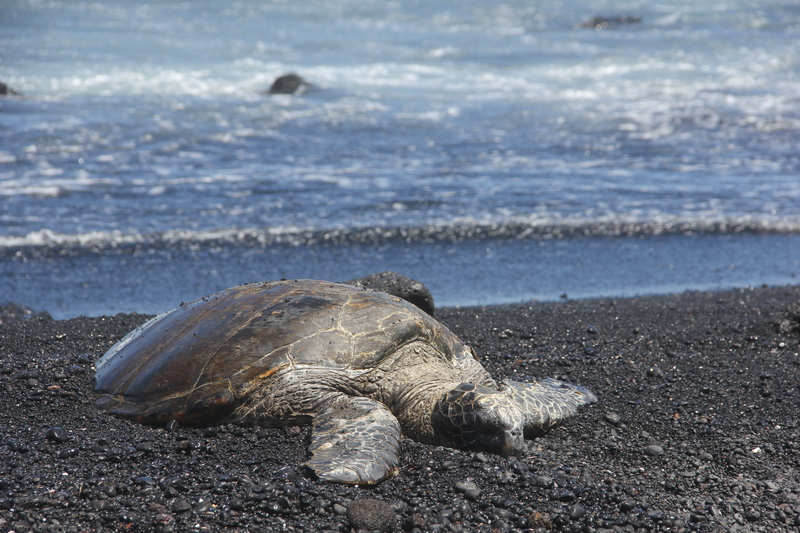 The ancients are the Green, Hawksbill, Loggerhead, Kemp’s Ridley, Olive Ridley, Flatback, and Leatherback. The Leatherback has a slightly different lineage than the others but they all have characteristics that are virtually unchanged over the millennia. 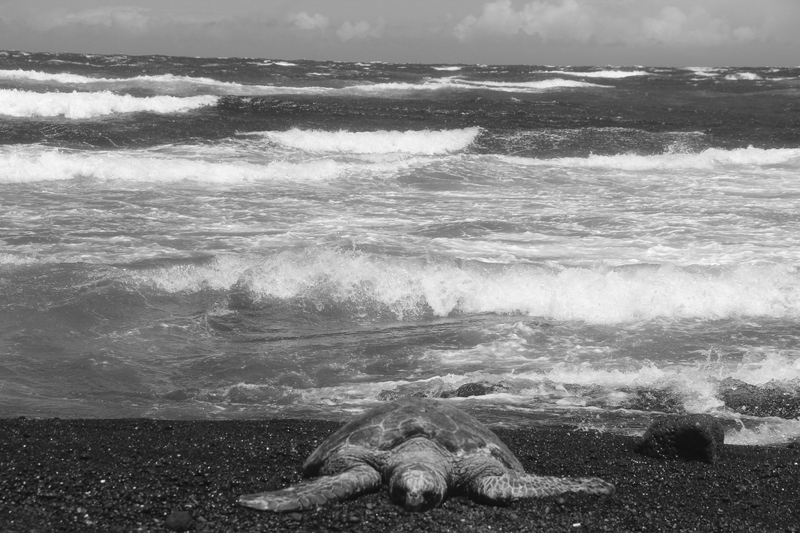 Unfortunately there is now one agent of change which is universally driving sea turtles toward extinction. It is their interaction with humans. 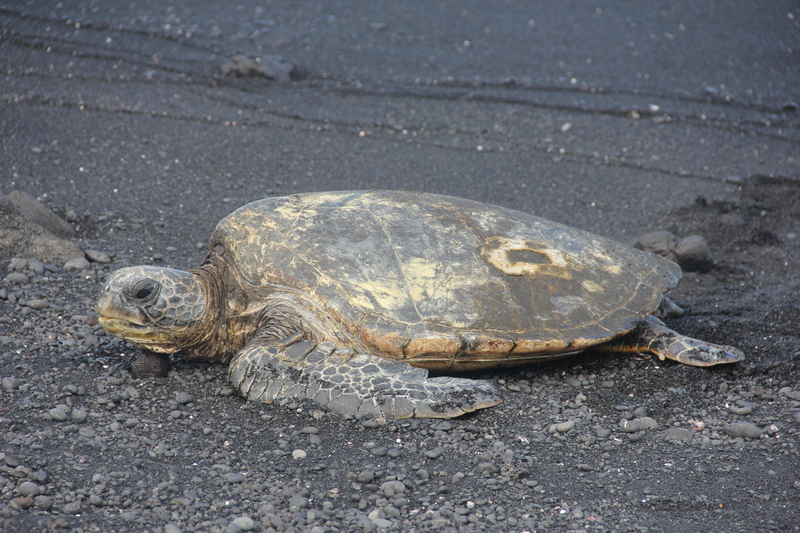 One exception to that is a place where the sea turtle (honu) has always been revered and is a part of the cultural history. Hawaii. 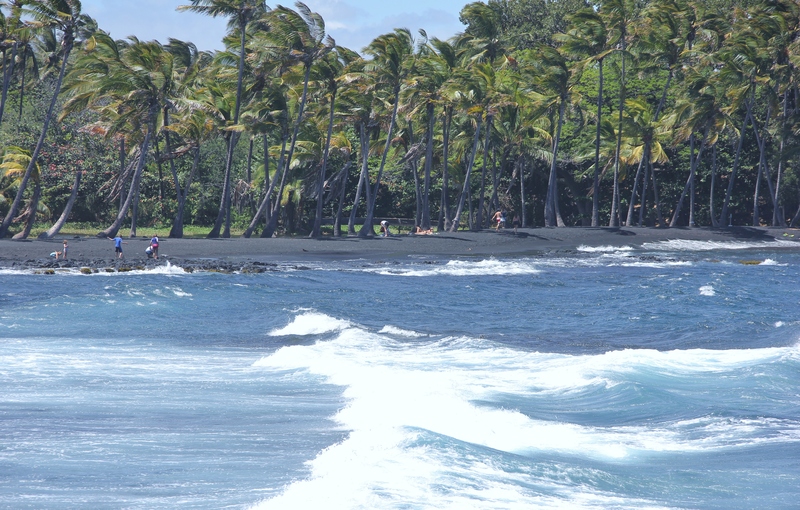 Punalu’u is a volcanic black sand beach on the SE coast of Hawaii island. 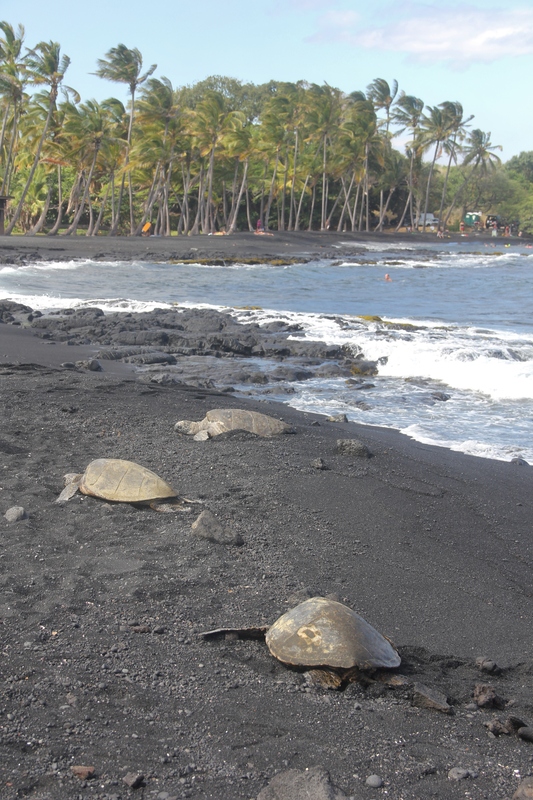 Since ancient times it has been a haven for sea turtles. 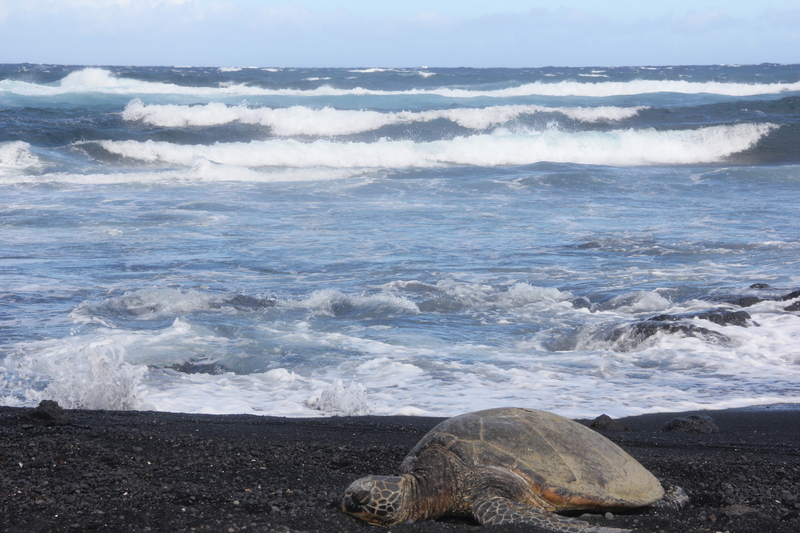 One night long ago a magnificent turtle with a snow white head named Honu-po’o-kea and her mate Honu-‘ea came to this beach. 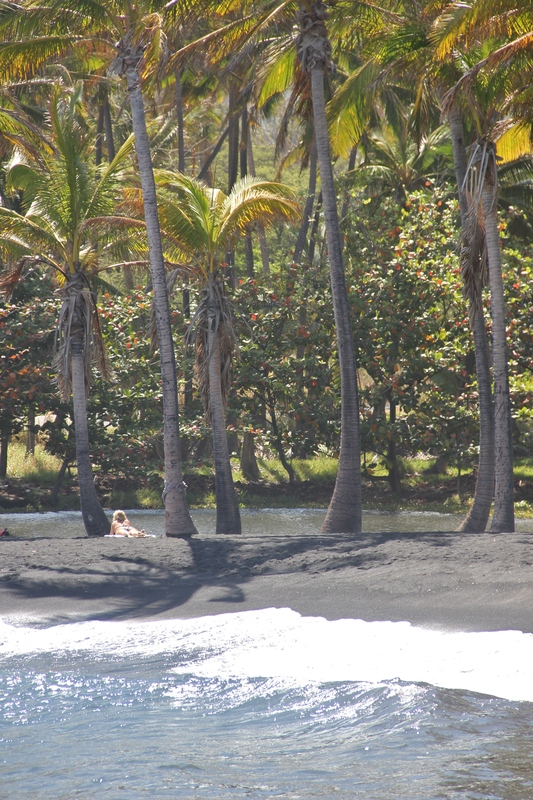 With their flippers they dug into the black sand and uncovered a spring. Digging deep into the earth they formed a fresh water pond near the nest where Honu-po’o-kea had left a beautifully brown polished egg. Kauila is the mystical turtle that hatched from the egg and she lived in the pond. As she grew she loved to play with the children on the shore and had the supernatural ability to change into a little girl. 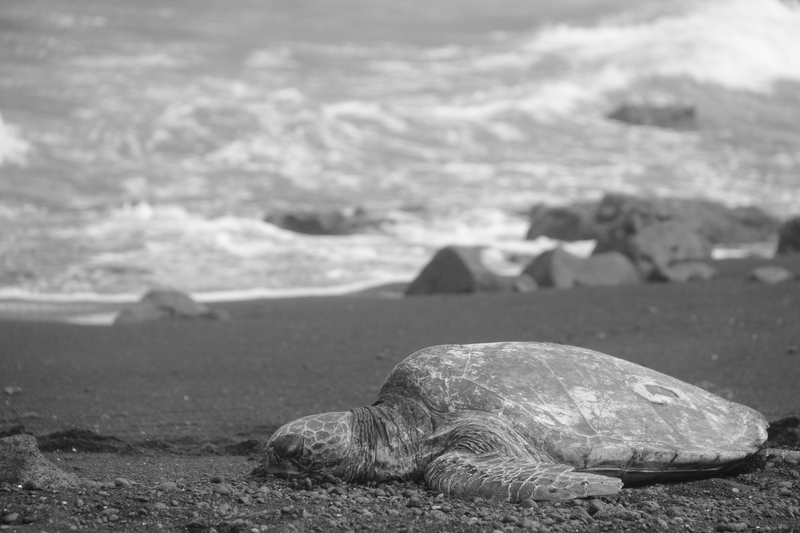 When the children were in the water Kauila would change back into a honu and watch over them so the strong ocean currents would not carry them away. 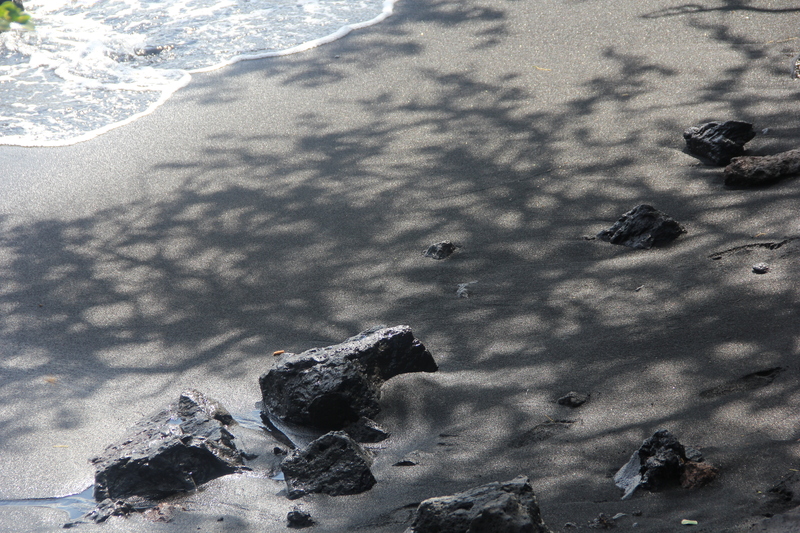 Black sand is volcanic in origin. When hot flowing lava enters the cool waters of the ocean it shatters into pieces. Erosion and tumbling will round the edges and wave action will deposit the particles on the shore line. Sea turtles have an amazing geo-compass to guide their travels. 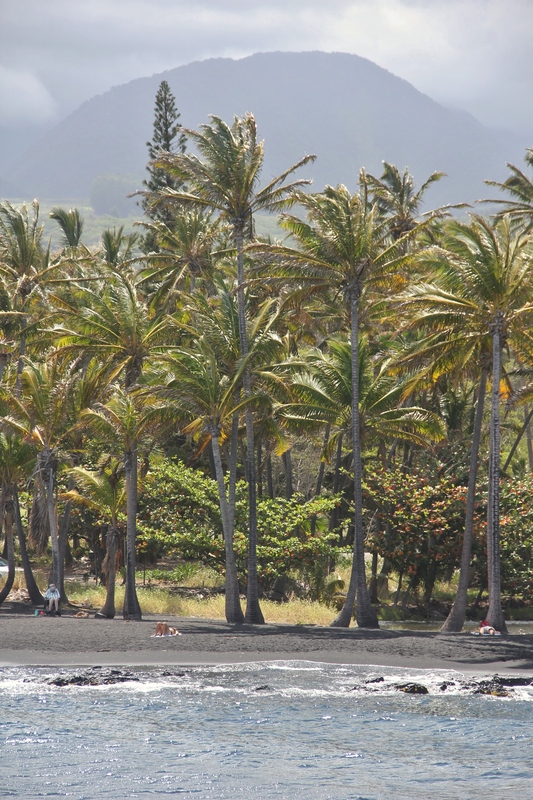 After a long journey they choose to come to Punalu’u for a reason. To rest. Do not disturb. 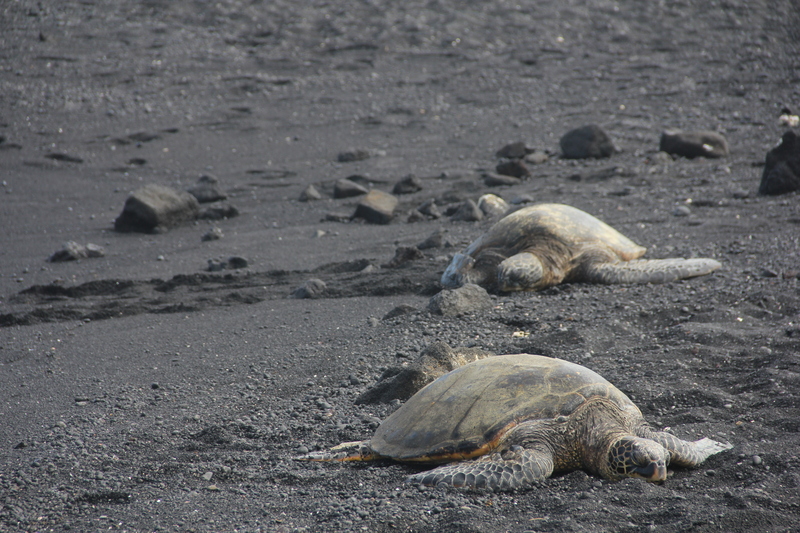 Distances covered by sea turtles migrating between feeding grounds and nesting sites can be greater than 6,000 miles. They often traverse entire oceans. Swimming such incredible distances takes stamina and phenomenal orientation abilities. 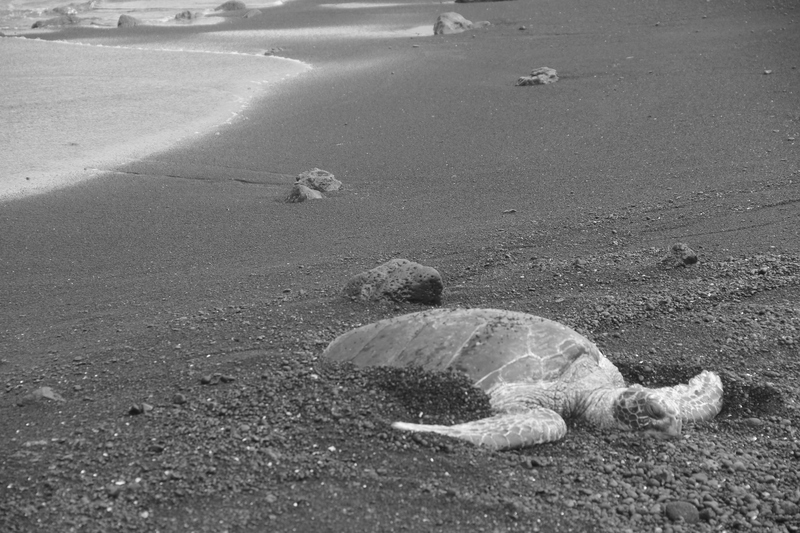 How sea turtles find there way while circumnavigating the world is not fully understood. What is known is that most females will return to their natal rookery to nest. Every three or four years after swimming thousands of miles they will return to the very same beach where they were born to lay eggs of their own. If they return and a condominium or seawall has been built in that place they are doomed to wander, never having a home base ever again. Please do not purchase combs, brushes, shoes, novelties or soup of turtles. Turtles live 70 to 80 years or longer and Kauila would be very very old . Now her children watch over our children. Shouldn’t we do as kind. 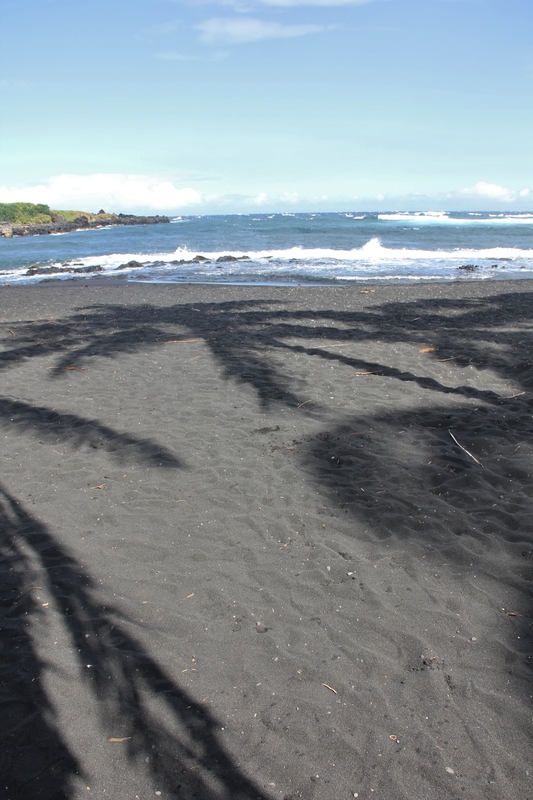 At Punalu’u the families and children and honu and I, enjoyed the first day of June in Twenty and Twelve. Aloha. This entry was posted in environment, Nature, water and tagged beaches, Hawaii, nature, photography, sustainable. Bookmark the permalink. Talk about being well adapted (and adaptable) to your environment. Seems that mother nature “perfected” these beautiful creatures the first time around! Thanks for that, Dohn. I didn’t realise turtles had been around so long or were so widespread. So that’s something I’ve learnt today. Fascinating piece and great pictures. It was a bit of a surprise to myself that sea turtles are such (unchanged) ancient creatures. Cheers. Beautiful post. Why are humans (like me, I would have to admit) so destructive of all the beauty around us? Loved this post. 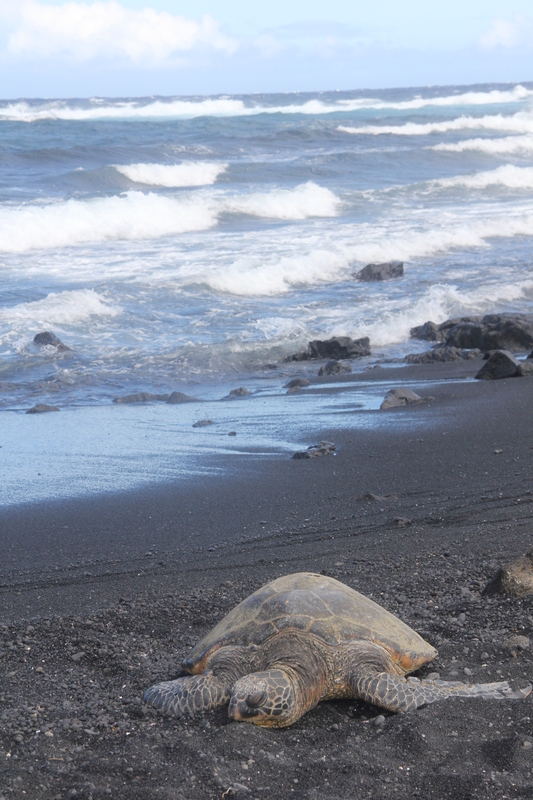 Loved the pics of Hawaii and all the sea turtles. Thinking of moving to Hawaii and your pics remind me of why making the big move would be worth it! Beautiful…I just spent a week diving in Bonaire and had some nice dives with Hawksbill sea turtles….so beautiful, so powerful…..thanks for your post!!! Awesome story. Thank you for the photos and story. I haven’t heard this much about turtles since I was a kid. Powerful and informative as always … thank you for sharing this amazing history. Just beautiful…. ♥ Truly amazing creatures. Wonderful photos of the sea turtles!